Footage of the Los Alamos water boiler reactor from the AEC Collection. The United States and the Soviet Union, former allies, become adversaries in a “Cold War,” and nuclear weapons become the weapon of choice for both sides. From 1947 to 1953 the threat to use nuclear weapons became the principal currency of conflict. During the Korean War, Texas Congressman J. Frank Wilson said, “We are dealing with mad dogs ... we must treat them accordingly. I urge the atomic bomb be used if it can be used efficiently.” Against this background, President Harry Truman made crucial decisions that affected the history of the Nuclear Age. The United states deployed the B-36, a huge intercontinental bomber. It started mass production of atomic bombs. In 1952, the US exploded the first hydrogen bomb, a quantum leap in destructive force. Less than a year later, the Soviet Union exploded its own hydrogen bomb. 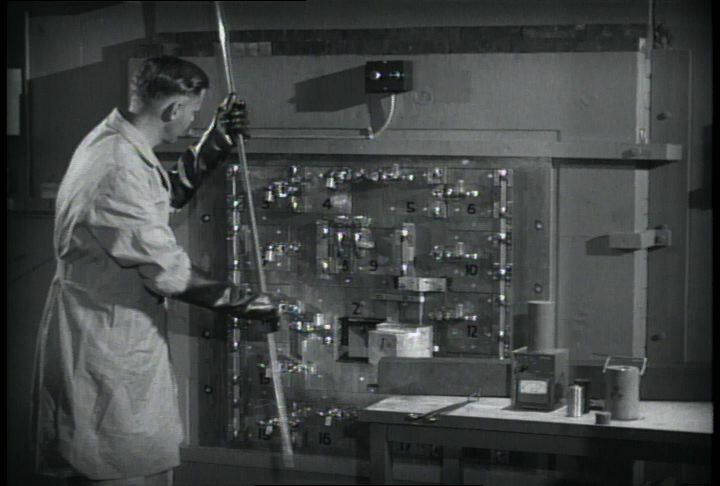 Chicago: “War and Peace in the Nuclear Age; Weapon of Choice, The; Los Alamos Water Boiler Reactor,” 01/01/1960, WGBH Media Library & Archives, accessed April 21, 2019, http://openvault.wgbh.org/catalog/V_04504A22143A41F0ACE25CF596292CFF. MLA: “War and Peace in the Nuclear Age; Weapon of Choice, The; Los Alamos Water Boiler Reactor.” 01/01/1960. WGBH Media Library & Archives. Web. April 21, 2019. <http://openvault.wgbh.org/catalog/V_04504A22143A41F0ACE25CF596292CFF>.